Enjoy the road to getting your driver’s license. Door to Door Driving School students receive an engaging classroom experience and comprehensive behind-the-wheel training. Flexible scheduling lets you learn to drive at YOUR convenience. Practical training helps you BEYOND passing your driver’s license road test. You’ll complete your driver’s ed training with a useful understanding of car maintenance, saving you money and hassle down the road. 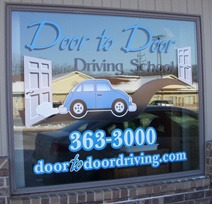 Thank you for your interest in Door to Door Driving School. Check out these real driver’s ed course testimonials from students just like you in East Troy, Elkhorn, Burlington, Wind Lake, Muskego, Mukwonago, Waterford, and Rochester. Students come to Door to Door Driving School with an ultimate goal of earning their driver’s license. You’ll start out with classroom instruction geared toward your Wisconsin learner’s permit certification test. Upon getting your permit, you’ll experience our behind-the-wheel training to prepare you for your Wisconsin driver’s license test. You’ll take a realistic practice road test starting from the Elkhorn DMV. With hundreds of students having experienced our proven results, you’ll be confident Door to Door Driving School has put you in the best position to succeed on your driving test. Door to Door Driving School specializes in providing Wisconsin driver’s education classes tailored to the busy schedules of students and their families. We will work with you to create a custom schedule for your driver’s ed courses. Door to Door Driving School delivers behind the wheel training primarily in Waukesha , Walworth, and Racine Counties, mostly serving students from the Mukwonago, East Troy, Waterford and Muskego school districts, covering parts of Burlington, Elkhorn, Vernon, Union Grove, North Prairie, Eagle and the surrounding areas. Get started today. Contact a DPI and DOT-Certified Wisconsin driving instructor or register for a driver’s education course using our simple online form.